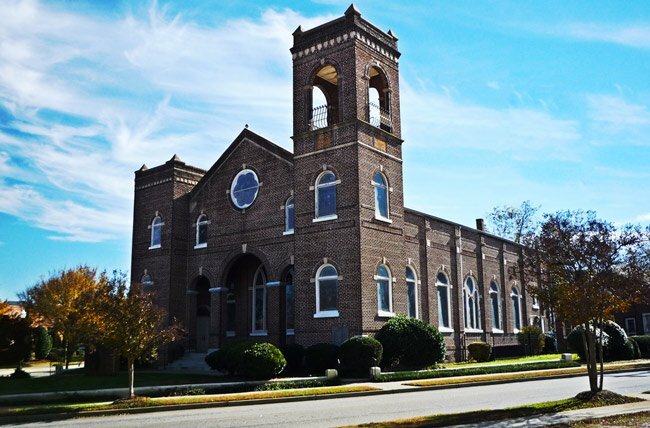 Significant as Greenville‘s first African Methodist Episcopal (AME) church, Allen Temple AME developed during Reconstruction when the Reverend William Beckett started an AME church in a former Methodist building in 1871. However, this mission church folded under the protests of whites, who objected to blacks meeting in their building. The Reverend R.W. Sinclair revived the church in a blacksmith shop in 1875, and by 1880 this group had 13 members and was sharing a building with Washington Street Presbyterian Church, which was later renamed Mattoon Presbyterian. In 1880 the mission church bought the building from the Presbyterians and formally called itself Allen Chapel AME Church. The Right Reverend Richard Allen founded the AME denomination in Philadelphia in 1816, and the church flourished in the South following the Civil War when many former slaves were free to start their own churches. Allen Chapel AME Church eventually sold its building and purchased the lot where the current sanctuary sits, erecting a frame building on the property and renaming the church Allen Temple AME Church. As membership grew, the need for a larger church arose. A building campaign was underway by 1927, with some members mortgaging their homes to raise money for a new church. Aid was also granted by the denomination. In 1929, the only black architect in Greenville at the time, native Cuban Juan Benito Molina, began building this Classical Revival church and completed it in 1930. The congregation added the Dreher Educational Building to the church complex in 1947, named for the Reverend Franklin D. Dreher. A preschool and kindergarten were subsequently established at the church, making Allen Temple AME Church the first black church in Greenville to offer a kindergarten program. Allen Temple A.M.E. Church, built 1929-30, is significant as the first A.M.E. church in Greenville, and architecturally significant as an excellent example of early twentieth century Classical Revival ecclesiastical design by Juan Benito Molina, a Cuban-born and educated architect, the only black architect practicing in Greenville in the early twentieth century. Organized during Reconstruction as a mission church, Allen Temple A.M.E. was formally organized as a separate congregation in 1881. The church is a large gable-front, steel-frame brick building laid in American bond, with projecting twin towers of unequal height, set upon a partially-subterranean brick basement foundation that features a soldier course water table. A rowlock brick course is located between the water table and the facade’s first floor windows and wraps the building at the window sill level. Other architectural features along the upper facade and other elevations include another bordered soldier course band around the entire building, square cast-stone panel insets on each pilaster that align with the bordered soldier course, and a rowlock brick band at the height of the pilaster capitals. All windows feature cast stone sills, wood frames, leaded stained glass (both geometrical and pictorial), keystones and impost blocks. The church’s west tower is three stories in height and contains a large open arched belfry that once housed the church’s bell, with belt courses, cornices, corbels and pyramidal finials at each corner of its roof’s parapet. The two-story Dreher Educational Building was added in 1949. To the rear of the church is a Craftsman bungalow residence, built ca. 1920, but sheathed in brick between 1929 and 1949, long used as the church parsonage, that contributes to the significance of the Allen Temple A.M.E. Church.